David C. Iglesias, a former United States Attorney for the District of New Mexico, will speak at 7 p.m. today at the Science, Engineering & Technology Building Lecture Hall. 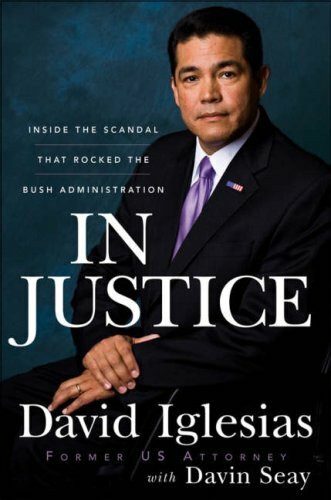 Iglesias will sign copies of his book, “In Justice; Inside the Scandal That Rocked the Bush Administration,” after the presentation. For a live Web cast, click here. For more information, call (956) 882-5111 or (956) 882-5141. I will be there. Thank you Melissa for posting this. What's up with the way the maquinita" busts are going on? I'm all for what the law enforcement officials are doing but I found out today that there are some "maquinitas" that are being tipped of the raids and close shop before law enforcement gets there. What's up with that? Those "maquinita" busts are an interesting topic. Lately I have seen numerous cars parked at night in a building that used to be a day care next to Tony's Barber Shop. Before there were no cars. But now at night its semi packed. And there are no signs stating that it is a bar, day care, or a legal "maquinita". Either it is a "maquinita" or those day care kid's parents are having a hell of a good time. If law enforcement is tipping of owners of the "maquinitas" who else may they be tipping off; Coyotes and drug traffickers? Frightening. Indeed, very frightening. "Maquinitas" are not legal just like drugs. So I agree, if someone is being tipped off, that is frightening. I mean, it's no wonder why this area is drug infested and it's not because the drug dealers are that stealth. They have the assistance of certain law enforcement officials. MDA Lock-up Thursday at Buffalo Wild Wings!